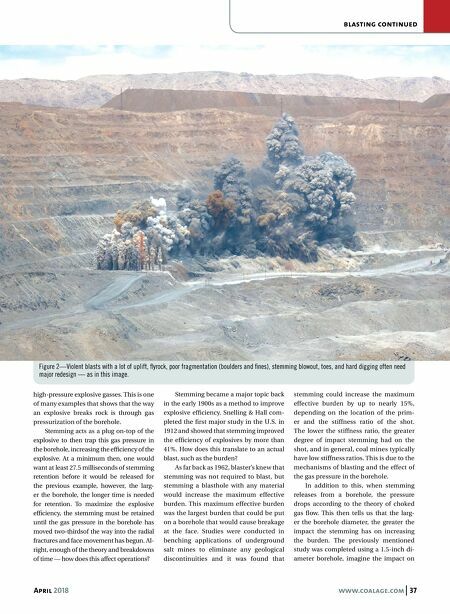 36 www.coalage.com April 2018 blasting Stemming for Large Blastholes Blasters should not underestimate the value of proper stemming by anthony konya and dr. calvin j. konya Stemming is a critical aspect of the blast- ing process that is often under-appreci- ated due to the misinformation that it is strictly for reducing the air overpressure (noise) from a blast. While this is import- ant in sound-sensitive environments, such as close proximity to neighbors, little attention is paid to stemming in applica- tions far from residential areas. Anyone that has worked briefly around explosives could see that the stem- ming in Figure 1 is really poor. The burden is not breaking. Now let's look at Figure 2. 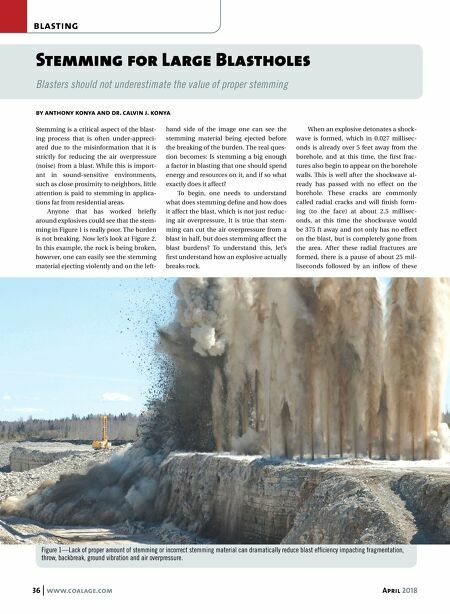 In this example, the rock is being broken, however, one can easily see the stemming material ejecting violently and on the left- hand side of the image one can see the stemming material being ejected before the breaking of the burden. The real ques- tion becomes: Is stemming a big enough a factor in blasting that one should spend energy and resources on it, and if so what exactly does it affect? To begin, one needs to understand what does stemming define and how does it affect the blast, which is not just reduc- ing air overpressure. It is true that stem- ming can cut the air overpressure from a blast in half, but does stemming affect the blast burdens? To understand this, let's first understand how an explosive actually breaks rock. When an explosive detonates a shock- wave is formed, which in 0.027 millisec- onds is already over 5 feet away from the borehole, and at this time, the first frac- tures also begin to appear on the borehole walls. This is well after the shockwave al- ready has passed with no effect on the borehole. These cracks are commonly called radial cracks and will finish form- ing (to the face) at about 2.5 millisec- onds, at this time the shockwave would be 375 ft away and not only has no effect on the blast, but is completely gone from the area. After these radial fractures are formed, there is a pause of about 25 mil- liseconds followed by an inflow of these Figure 1—Lack of proper amount of stemming or incorrect stemming material can dramatically reduce blast efficiency impacting fragmentation, throw, backbreak, ground vibration and air overpressure.